There’s a lot of love going around for Detroit lately and for good reason. The economy is rebounding, bike infrastructure is being built at an incredible pace and, what we’re most excited about, the food and drink scene is booming. Detroit, and Michigan as a whole, have a great history in food and drink. From it’s place in rum running lore (we have a tour for that!) and growing apples to Coney dogs and soda pops. The most famous and arguably oldest of those sodas is Vernor’s Ginger Ale. The refreshing drink was invented in 1866 and is thought to be the oldest surviving soda in America. Metro Detroit expatriates, including those from Windsor, Ontario, are almost always quick to say a swig of Vernor’s is one of the things they miss most about home. The ginger ale was recently featured in a Huffington Post list, “10 Reasons Vernors Ginger Ale Is The Best Drink You’ve Never Heard Of“. 85 years ago at this exact moment, the Windsor-Detroit tunnel opened up to the public allowing us easy access to some great food and drink on both sides of the border…..that is why they built it, right? Being across the river from the Motor City, Windsorites have always had a great connection to Detroit. The constant flow of traffic carrying workers and those looking for great food and entertainment on both sides of the border is a constant reminder of the close bond. 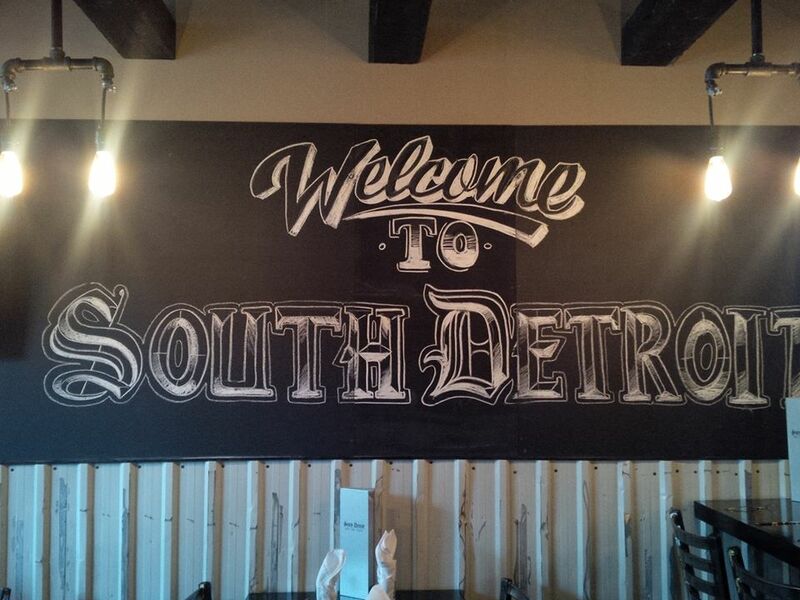 A local restaurant in Windsor named South Detroit based the theme of their restaurant on this cross-border love. And yes, Windsor, Ontario is south of Detroit, Michigan. Born and raised in South Detroit…. 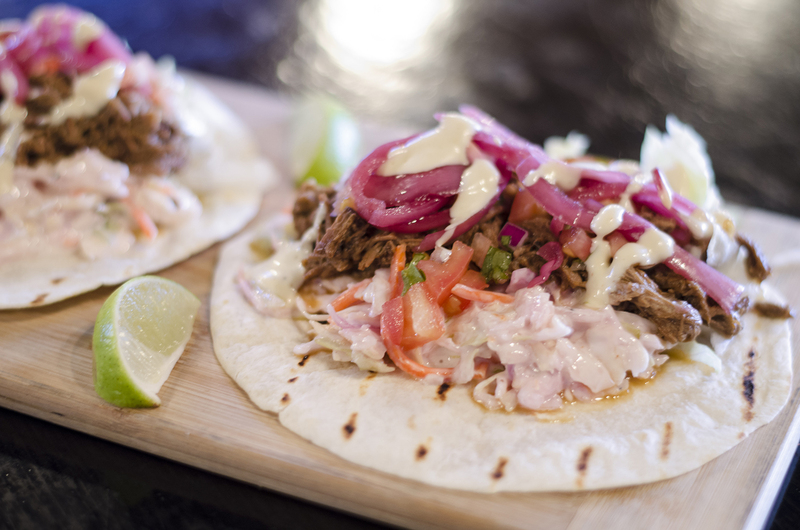 Along with the decor throughout the restaurant and menu items named after Detroit lore, several of their dishes also include ingredients right from the D itself, most notably their braised beef tacos. After being dry rubbed, the beef is slow roasted in Vernors Ginger Ale for up to 12 hours. Low and slow is usually the way to go to ensure the beef stays juicy and full of flavour. And oh my, the flavours. I mean, come on. Vernor’s. Braised. Beef. Tacos. Any of those words alone could stand on it’s own. Put them together and it’s bound to be pure awesomeness. Am I right? Try the recipe for yourself at home. If you’re too lazy or just think everything tastes better when someone else makes it for you, give South Detroit a visit. Rub beef in dry ingredient. Place in roasting pan and add Vernor’s Ginger Ale, molasses, and any remaining dry rub. Slow roast in oven at 175 f for 10-12 hours. Pull Beef apart with fork or tongs. If any remaining juices, reduce juices on stove top until only juicy beef remains. Arrange shredded iceberg lettuce and creamy coleslaw onto a grilled flour tortilla. 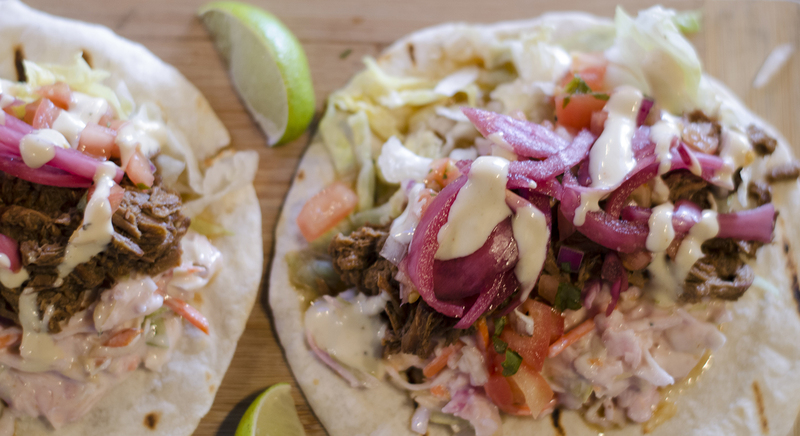 Place on two or three ounces of Vernor’s raised beef and top with pico de gallo and pickled red onions. Drizzle with chipotle ranch and serve.